One of the few cold “soups” I enjoy a lot is Gazpacho. I put quotes around the word soup because this refreshing summer treat is more like a beverage. It is best poured in a tall glass and chugged. On the other hand, Gazpacho is quiet filling and makes for a more than decent meal, probably because of the bread in the mix. It is of course very simple to make. 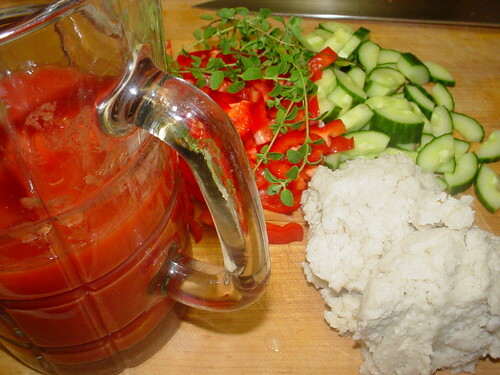 Some stale bread soaked in water, tomatoes, cucumber, a bell pepper, garlic and oregano. It is all a matter of taste when it comes to this primarily Spanish dish. Some recipes include onions in there (not to my taste at all), neither is cumin, others include basil (makes it taste like marinara sauce if you ask me). I like some fresh oregano and I like to finish it off with sherry vinegar and a good dose of black pepper. The whole lot is pureed in a blender or a stick blender. 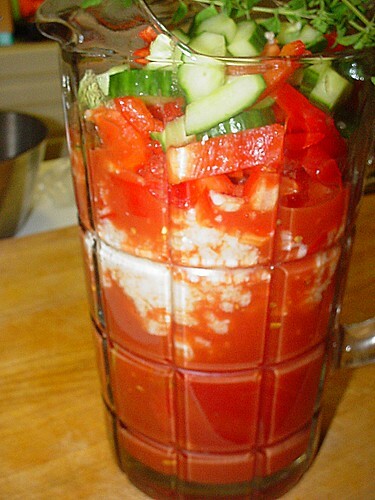 The last step, while it might seem unnecessary is to pass the Gazpacho through a sieve to obtain a smooth uniform soup. This really makes a difference. To serve it, you can go the fancy way and pour the Gazpacho in a bowl and top it with tiny dice of cucumber, minced hard-boiled eggs, slivers of Jamon Serrano, tomato cubes, finely chopped herbs, very very small croutons, a drizzle of olive oil, herb oil…the variations are endless. On the other hand, more often than not, I keep the pitcher in the fridge, pour me a glass and call it dinner or lunch. Sorry, no pic of the final result. I forgot. Really though, it is nothing more than tomato soup in a tall glass.